Badan Penyelenggara Jaminan Sosial Kesehatan - BPJS Kesehatan is the national health social security agency of Indonesia. 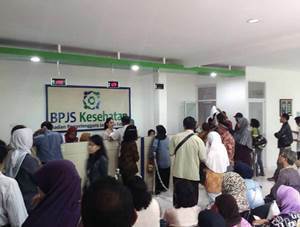 BPJS Kesehatan is an Indonesian government-owned health social security agency. BPJS Kesehatan was formed on 31 December 2011 to replace the function of state-owned health-care insurance firm PT Asuransi Kesehatan Indonesia (Persero) or ASKES under the laws of the Republic of Indonesia No 24 of 2011. BPJS Kesehatan is completely owned by the government of Indonesia. Based in Jakarta, BPJS Kesehatan has 124 branch offices, 384 operational offices in regency (KLOK), 34 liason offices, and 1,487 BPJS Kesehatan centers spread in 13 regional offices across Indonesia (as of December 2015). Its head office is registered at Jl Letjend Suprapto Kav 20 No 14 Cempaka Putih, Jakarta Pusat 10510. Personal who is tenacious, tough and willing to work hard. Male with minimum background in Diploma Degree (D3) all the majors. Maximum age of 27 years old (per 31 December 2017). Preference is given to applicants with previous experience in the field of marketing. Strong telemarketing and communication skills. Possess personal vehicle (minimum motor cycle). Placement at Tanah Laut, Tanah Bumbu and Kotabaru. JobsCDC.com now available on android device. Download now on Google Play here. Please be aware of recruitment fraud. The entire stage of this selection process is free of charge. 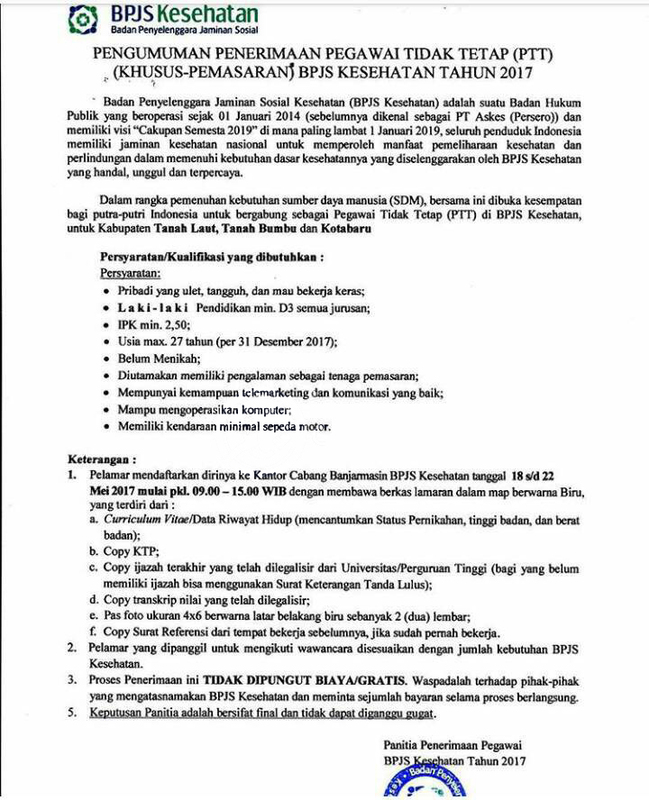 BPJS Kesehatan - Recruitment D3 PKWT Staff BPJS Kesehatan May 2017 will never ask for fees or upfront payments for any purposes during the recruitment process such as transportation and accommodation.